Riviera Nayarit is ready to become the supporting venue of the Pan-American Games Guadalajara 2011 through the sailing events that will take place in our destination. On October 7, the torch will be lit at Pan-American Villa, which is already complete at the Paradise Village Resort. The destination known as Mexico’s Pacific Treasure is known for its constant wind currents, its waters and its modern nautical infrastructure, and this is why the Mexican Sail Federation has chosen it to host the sailing competitions. 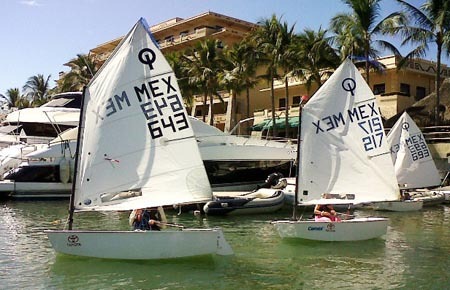 The Vallarta Yacht Club at Paradise Village Marina will be the official venue where the ships will depart to compete in the waters of Bahia de Banderas. The Pan-American torch will arrive next October 7 to Riviera Nayarit from Mazatlan, onboard a sailboat that will dock at the pier of the Vallarta Yacht Club, and will then light the fire at Paradise Village. To celebrate the arrival of the torch, our destination has prepared a show that will feature pre-Hispanic music, mariachi and a salute from State and Municipal authorities, as well as by touristic industry officials. We’re all convinced that Riviera Nayarit belongs to all the people from Nayarit and that we’re all Riviera Nayarit. The objectives devised by the State Government headed by Roberto Sandoval include promoting the development of our state by attracting visitors, which will allow us to reactivate the regional economy. After the torch is lit, it’ll continue its journey, and Graziano Sovernigo, owner of Paradise Village will be the first relay, before other municipal and state authorities, who will eventually hand the torch to their counterparts in the state of Jalisco, on the banks of the Rio Ameca. The route of the Pan-American flame will continue through the streets of Nuevo Vallarta and the Federal Highway 200, Puerto Vallarta-Tepic, and will be enjoyed by the general public. Riviera Nayarit is regarded by experts as one of the top destinations for sailing and for a number of water sports, which can be enjoyed throughout the year. Additionally, our destination has modern marinas, technicians trained to repair fiberglass, and all the technical and technological gadgets found in boats, as well as excellent tourist services. 1:00 pm Arrival of the sailboat with the Pan American torch. 1:45 pm Presentation of the pre-Hispanic Ballet in the amphitheatre. 1:50 pm The mariachi will receive the torch and head towards the amphitheatre at Pier One. 2:45 pm The Pan-American torch will head to Puerto Vallarta.